I became a huge fan of Amanda Jennings’ writing when I read her previous novel, In Her Wake, nearly two years ago now, so I was excited to see what her follow up would be. The Cliff House is an evocative and mesmerising piece of fiction with a dark undercurrent. Amanda makes the setting feel so real, and she draws you into Cornish landscape, I could easily picture the scenery around me. Sixteen-year-old Tamsyn has always been drawn to a property built at the top of the rugged, Cornish cliff face, known to her as The Cliff House. The house holds very poignant memories for her as she used to visit it with her father before he died and they would often swim in the pool when the family who owned it weren’t staying there, without their permission. Tamsyn becomes obsessed with the family who live there, the Davenports, who travel up from London to spend the holidays in Cornwall. To Tamsyn their life is full of glamour; it is the image of perfection. But their lives aren’t what they quite appear to Tamsyn, and as she becomes embroiled in their family troubles, it becomes harder for her to let go. Amanda writes her characters so well; like Tamsyn, I became captured by The Cliff House, especially in the opening chapter in which Amanda so brilliantly sets the scene through Tamsyn’s eyes as she stares at the house through her binoculars. Edie Davenport was a fiery and perplexing character, the relationship that she has with her parents is an interesting one, and it was one of the main hooks of the novel as Amanda slowly peeled away the dynamics in their relationship. I wanted to find out what was really going on in their lives. As Tamsyn and Edie Davenport became friends, I did wonder how she would fit into Edie’s life; I kept imagining scenarios inside my head as I wondered if their friendship was going to work as they both come from very different backgrounds and mix in different social circles. Tension simmers on every page as their friendship develops and as the drama in Edie’s family life begins to unravel. Amanda Jennings has written a superb novel. Her writing never fails to draw me in. The Cliff House is haunting and spellbinding, I loved it. 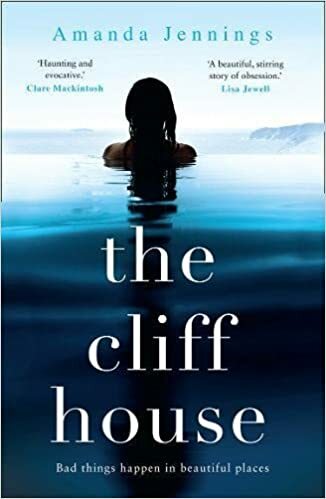 Thank you to HQ for sending me a copy of The Cliff House to review and for inviting me to take part in the blog tour. Didn’t know this author before. I think i should familiarise myself with her stuff, it sounds cool and my sort of stuff.